I’ve been traveling a TON over these past few years. Just last month, I was in San Diego then at the beginning of this month I was in Las Vegas. A week later I was in Louisville and I’m leaving for New York in a few days. I have noticed that a lot of people out there feel like travel is too expensive and not obtainable for them, yet I think it’s something we all envision when we think of “The Good Life”. I was thinking on a recent plane ride that I should be sharing some of the travel tips I’ve picked up along the way, especially how to make travel affordable and easy. The prices will likely go up every time you do the same search on the same device. If you do the same search more than once on your phone or computer, the cookies on that website will think you’re serious and raise the price on you. Here is one search on two separate devices done at the same time. The difference? My boyfriend had already done the search on his phone earlier in the day. He told me the price had went up from $52 to $69 per night and didn’t believe me when I told him about this phenomenon . . . until I did the search on my phone and got the price he had seen on his first search of the day. This photo shows both searches. Clearing all cookies on your device might bring the same result. One trick we’ve learned for making travel happen is to take the plunge by making one component of the total travel purchase. Sometimes that first purchase is just a ticket to an event, but usually it’s the plane ticket. Whatever it is, this first purchase gets you committed to the trip and is key to making it happen. We usually make that first purchase about 6 months in advance. Then each month after, we add another component. So maybe the first purchase would be the plane ticket, then the next month we would buy something less expensive like an event ticket, then 4 months out, we’ll secure our accommodations. We’ll pay for the rental car and start saving money for food closer to the trip. See how easy that is. I bet you can already imagine yourself doing this and see yourself on that trip you’ve been dreaming about. Are you ready to start? Let’s talk Plane Tickets. Not all airlines are the same. My favorite airlines are probably Southwest and JetBlue. Why, you ask? Hospitality. Both airlines make flying comfortable and easy. And frankly, it makes me mad when I show up for a flight and they want to charge for checking a bag, much less a carry-on. Maybe it’s because I started traveling before that was a thing, or maybe it just seems rude to me. I think there should be a law or something requiring that all their fees be packaged in the original cost. For this same reason, Frontier and Spirit are my LEAST favorite airlines. Perhaps it is a pay now, or pay later thing – but I feel cheated and angry when I show up for my flight and am asked to pay $35 FOR MY CARRY-ON. To add to my negative feelings about these airlines, their seats are by far the LEAST comfortable I have had the displeasure of riding in. Think DMV waiting-room seats . . . yeah, that. How to get the best deals on airfare? I usually look on expedia, and then with the window STILL OPEN to avoid the problem mentioned above, I double check that the deal is better than if I were to purchase directly on the chosen airline’s website. Also with the window still open, I will do a quick google search for package deals to the destination city (especially if it’s a popular place like Orlando or Vegas). Need a one-way? Compare a one-way cost to around-trip as sometimes round-trip is cheaper. If you have wiggle room on dates, try a few combos. I often find it’s less expensive to come home on Monday instead of Sunday. One of the biggest expenses of travel is the lodging. However, thinking outside the box can really expand your options. I like to look at home and condo rentals, for example. In Utah, there is a website called ksl.com where you can search for travel deals and I have found some great bargains there. There are several vacation rental websites and I have had good experiences with many of them. Also, check tripadvisor.com for hotels. There you will find the best deals for the money. When we went to Disneyland, we stayed in the best, and cheapest little hotel just a few minutes’ drive from the park. We found it on tripadvisor. Car rental companies. In general, I do not like car rental companies. But when you travel often, it is something you have to deal with. It seems to me that a number of car rental companies are primarily in the ‘overpriced insurance’ business, rather than the car rental business. We have had more than one experience of booking online with a given price, then showing up to have the price double or triple because of their insurance. We showed up for a rental car reservation in Orlando last year; the rental price was incredibly low ($17/day for a minivan), but their agents advised us that we would be paying a small fortune for even a scratch if we didn’t purchase their additional insurance. We payed hundreds over what we had initially budgeted, and have avoided the rental company called SIXT ever since. Now, in general, we do not opt for the added insurance as we have ‘rental car insurance’ added to our regular automobile policies. A few years ago, I learned a hard lesson when I backed a rental car into a cable in a parking lot in Alaska. There was a surprising amount of damage. My insurance paid for the repair of the vehicle, so I was surprised when a few months later I received a bill for about $3,000 for ‘loss of value’ to the vehicle and ‘loss of rental days’. I called my insurance company, who was of no help since they had already fulfilled their obligation. I talked to my financial advisor about the problem and she asked if I had by any chance booked the rental car with American Express. Thankfully, I had. And it turned out that American Express automatically includes some coverage with all of the reservations paid for with their card. Sure enough, American Express came through and settled the situation with the rental car company. We are now SURE to book and pay for ALL of our rental cars with our American Express. I also want to mention that though you could previously pay for a rental car with a debit card, as of 2017, you HAVE to have a credit card for car rental. Food is one of my favorite topics, in general – and especially in the context of travel. As far as saving money on food while away from home, I would recommend either staying somewhere with a kitchen so you can at least cook/prepare your own breakfast or, alternatively, stay somewhere with breakfast and make sure everybody eats it. (With kids, this can be a problem . . . they skip the hotel breakfast then are hungry as soon as you get going for the day). Finding GOOD, LOCAL FOOD, and even FOOD EXPERIENCES is the fun part! 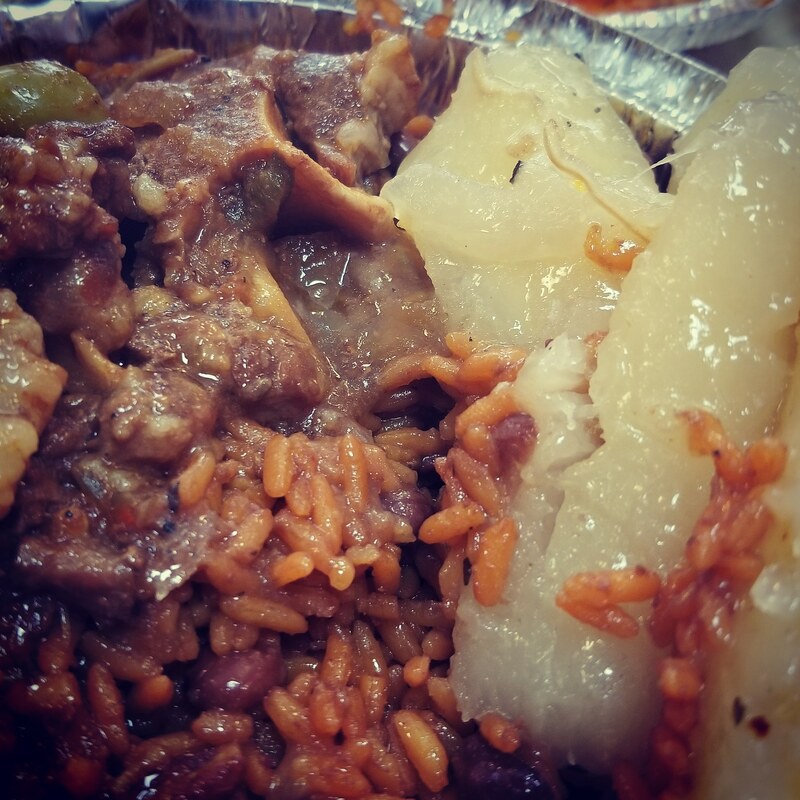 We are foodies, and as such, we have a few ground rules when traveling, the first is that we don’t eat anything on vacation that we could eat at home (i.e. no chain restaurants that we could go to in our home town). Of course, we have made exceptions to this rule when the plane lands after hours and such, but it’s a good goal of travel. How to find the BEST FOOD in a NEW CITY? Yep, the same place we find hotels. Lots of our favorite places have come from www.tripadvisor.com recommendations, including one of our favorite pizzerias we try to visit whenever we’re near Las Vegas, NV. 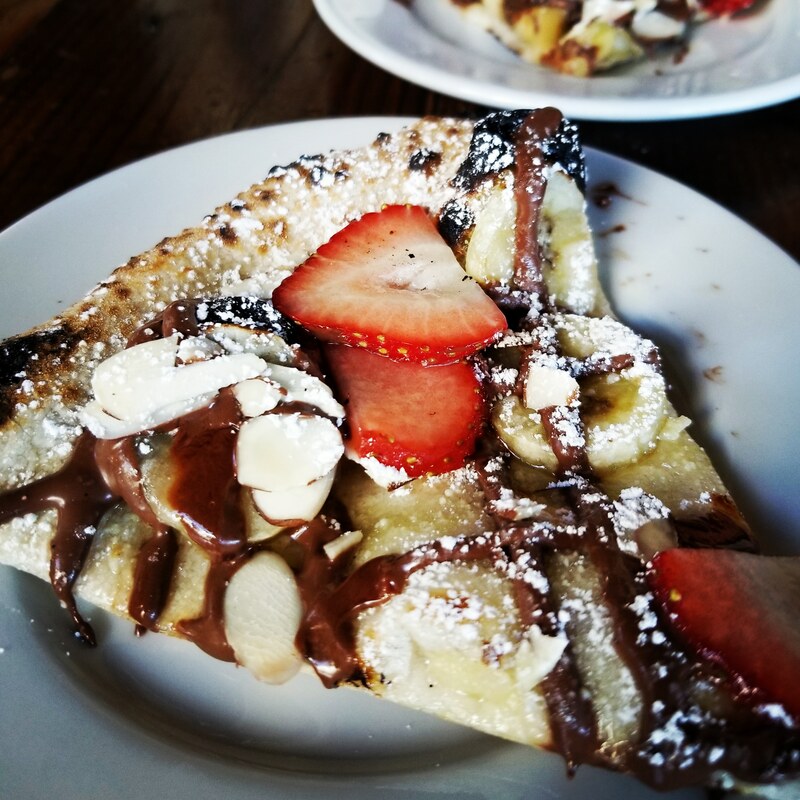 We love the pizza, but mostly come back for the Nutella dessert pizza and military discount (it’s called Settebello Pizzeria Napoletana if you’re lucky enough to experience it). They know their town and where they like to eat. We have found some amazing places this way. One of our favorite stories was in Milwaukee, WI. We had found a restaurant on TripAdvisor. When we got to it we were starving, but unfortunately, it was closed for the day. We wandered around looking for another place and asked somebody we happened upon for a recommendation. They sent us to the best little English Pub (called Red Lion Pub on Tannery Row, if you happen to be there). 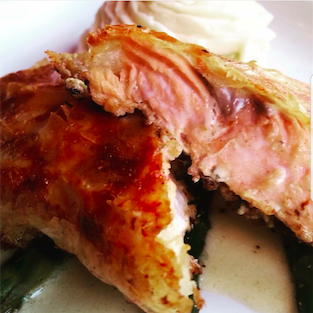 We had an unforgettable shepherd’s pie and a salmon wellington that was truly Instagram-worthy. The Food Network has a show in which the host, Guy Fieri travels around the country visiting America’s classic “Diners, Drive-Ins, and Dives” (the name of the show). We joke that we’re going to start our own show about a family who travels to the places in the show and reports on whether the food was as good as they made it look on TV. (Perhaps we’d call it “the show about the show”). We have been to 8 or so of Guy’s recommended stops and we have been blown away on every occasion but one (the one we didn’t like was in San Diego). On a recent trip to Louisville we went to a DDD stop (Momma’s Mustard, Pickles & BBQ) and tried the wings that were purported to be “the best in the country”. Now, I don’t even like wings (my honey for the win on his order), but I couldn’t help making audible sounds of delight as I ate “Momma’s” wings. SO GOOD! (And, oh yeah, there is an app to help you find the DDD stops near you). Once you’ve picked a place . . . Check groupon.com for deals at the restaurant you picked. 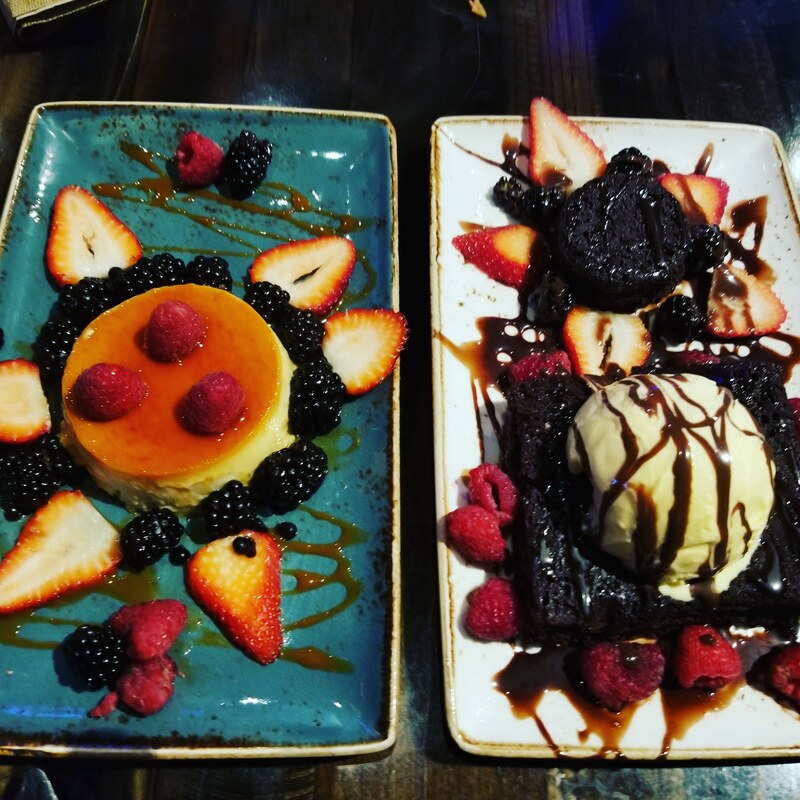 We recently found a groupon that saved us big time ($50 for $100 groupon) at an amazing Mexican restaurant on the Vegas strip (Chayo Mexican Kitchen & Tequila Bar). They have the best flan we’ve had anywhere in the country (which is saying something when your boyfriend is Puerto Rican). 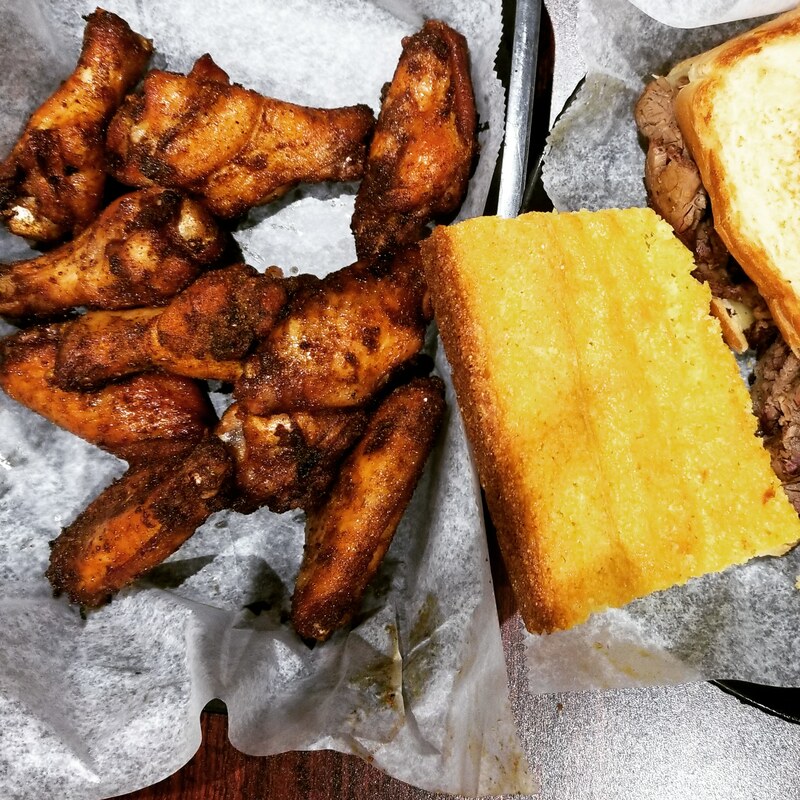 Once you’ve had a seat, check out the menu, sometimes (like with the wings mentioned above), the menu will tell you what the place is known for. If not, ask the server what the restaurant is popular for and/or what is their favorite thing on the menu is. Our second rule of travel is that no two people at the table should order the same thing . . . this way you get to sample more than one of the restaurant’s popular dishes. My favorite dish is almost always the one my boyfriend or one of my sons ordered. We also use meal sharing in another way: to save money. I don’t want to throw money away when I travel and to avoid doing that, assume that all restaurant meals are going to be enough for two people. And if you’re wrong, you can always order more . . . or skip more dinner and go for the dessert. This tip, whether we’re traveling or eating out at home saves our family a LOT of money over time. Sharing meals also helps your waistline and the planet (less food going to your hips AND the land fill). This brings me to more tips for staying healthy when you’re #alwaysonvacation like we are. You need to get your veggies in no matter where you are in the world. I try to incorporate a salad every day. When we share meals like I suggested above, you can easily add a side salad to your order for a couple of bucks. (Remember that even more important than eating healthy on the go, is feeding your body right day to day. Click here for more tips on eating well wherever life finds you). Also, we almost always drink water and nothing more, both at restaurants and throughout the day. In fact, if we have a rental car, one of our first stops is at a grocery store for a case of bottled water to help make sure everyone stays hydrated on the trip. No rental car to grab healthy supplies? No problem. Download the InstaCart app and someone will deliver your shopping list directly to your hotel for a very small fee. Have them bring you whatever supplies you left at home, some produce, and any of your favorite snacks. For example, we also hit up the store for almond milk which we mix with our morning protein shake mix. The powdered protein/probiotic mix we use (and travel with) is micro-ionized, so no blender needed – just drink a few sips of your water, add the mix, and shake. Of if we have an empty water bottle from the day before, we’ll fill it with almond milk, add the powder, shake and enjoy. (Click here to go to the website where I buy it). Starting you day with good nutrition like this makes it so much easier to have energy to enjoy your travels. I can honestly tell you that our supplements are the first thing we pack for any trip and I always have at least a day’s supply for each of us in my carry-on (just in case). Again, here is the link for the supplements we pack, and click here if you’re not sure whether you need supplements. I also pick up and browse through any free city publications that catch my eye at the airport, the car rental counter, the hotel lobby, the visitor’s center, and the grocery store. (I have made lots of cool discoveries about our own city this way, too). Now that you know how to make travel affordable and easy, you’re probably wondering how to make time for it, right? You don’t have to look very far to see people talking about their “laptop lifestyle”. Is there a part of you that wonders how that can be a reality for you? I started working when I was 14 years old and was an “employee” for one or more establishment until July 2017. At that point, I left my job of 14 years. If that is something you are interested in doing, read on. How can you make a Laptop Lifestyle a reality for you? I actually did and still do a combination of activities that give me the kind of flexibility I had craved for so long. Flexibility, though, doesn’t mean that I don’t work. A “Laptop Lifestyle” means that you will be traveling with your laptop. I have worked and built reports and written e-mails from lots of places. In just the last few months, I have worked: before bed in a hotel room in San Diego, just before heading out the door to a show in Las Vegas, on a flight to Denver, right after a cruise around Manhattan, and in the airport in Chicago. It is so nice, though, to be able to go to all these places and to fit my work into my life instead of the other way around. OPTION 1: Can the job you currently have be performed remotely? From 2003 to 2017, I worked 40-hour weeks as an office manager for an oilfield service company. After so much time there, I had built up to 4 weeks of paid vacation per year, but with 3 kids and all their obligations, I used up my 20 days in a hurry. Most of my job required that I be on location, but when I quit my job, I was able to retain some of my responsibilities. In collaboration with the awesome lady that replaced me, I am able to do a number of the reports and online work I did at the office. Could this be an option for you, as well? There has never been a better time to be in business for yourself, and these days it couldn’t be easier. Lots of people I know set their own hours working service jobs through aps like Uber and Lyft. One example is the grocery shopping service I mentioned above: InstaCart. If you think you would like to set your own hours shopping for people, click here to learn more. Before I left my former job, I created my own company, The Good Life 4 Us, LLC. It is through this company that I create and sell products and programs to help people make over their lives. You can see a full listing of my offerings at www.thegoodlife4u.club. In addition to this, I’m a certified personal trainer and can work with people that way, too. Are you someone who rolls your eyes at the idea or someone who is open to it? I was in the first category through my 20s and 30s, but when I stumbled upon a product I love, I unwittingly signed up for my first MLM. And I’ve received a paycheck almost every week since then. I am not yet an MLM success story, but I do get a little extra spending money every month – and who couldn’t use a little bit of that. Now, remember, the industry is highly regulated and people aren’t allowed to tell you how much money they actually are making, which doesn’t mean that there aren’t a lot of stories of people replacing their income with network marketing. A great movie that might open your eyes is “Rise of the Entrepreneur”. (Clicking the blue letters will take you to my amazon affiliate link). As it states in this movie, the hardest part about being part of an MLM is making your lifestyle a higher priority than the ridiculous stigma associated with MLMs. I have listed here three methods that have given me the laptop lifestyle I desired. There are no doubt many, many other methods to make your life what you dream for it to be. If travel is on your agenda, don’t make excuses for not doing it. Life is short, my friend. If you want it, whether it is travel, more time with your family, a new career path, etc. – If you want it, make it happen! What are your tips for easy and affordable travel? Please share them with me! Marcy Vogler is a lifestyle makeover coach, personal trainer, and mother of three. Marcy is passionate about helping women make over their lives from the inside out. To learn more about the courses Marcy offers, check out our parter website at www.thegoodlife4u.club. For daily inspiration, join Marcy’s Facebook Group: Love Your Day, Love Your Life. Do I really NEED a multivitamin dietary supplement (or is eating healthy enough)? Ready for a Mood Makeover™? What is causing my itchy rash?